Famous artist Masuto grows weary of digital painting in the mental institution where he lives only in his mind with his AI guide TOKI. Salvation appears in the form of Endo Ichiro hacking into his system and offering to free him and create a cyborg body for him to paint again in real life. Ichiro shares astonishing revelations to encourage cooperation, but salvation does not live up to expectations, and Masuto must seek release from his savior. Barr creates a swirling, complex world of technology-enhanced living, developing memorable characters in a credible digital environment. Emotions bleed from this tale of harsh reality, deception, and eventual “homecoming.” Brian Barr is an exceptional storyteller; this is the fourth novella in the Nihon Cyberpunk series. 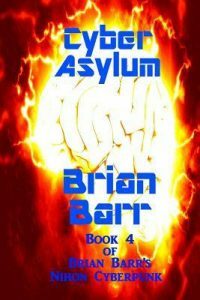 Look for all of them on his website http://www.brianbarrbooks.com/, Goodreads, and Amazon.